#8/9 Terriers dropped their season-opener to #11 Minnesota State, 4-3, at the Verizon Center in Mankato. Mavericks’ forward Dallas Gerads scored the game-winner midway through the third period, collecting a puck behind the net that Jake Oettinger fanned on and tucking it in for a wrap-around goal. Game two of the weekend series starts at 8 p.m. ET. MSU opened the scoring at 11:56 of the first when Parker Tuomie’s shot from the left circle beat Oettinger. 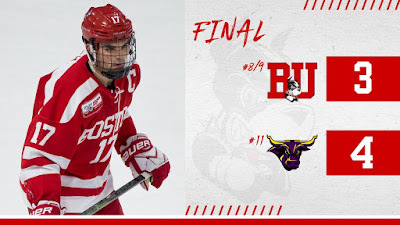 BU evened the scored with just 4.5 seconds remaining in the period when co-captain Bobo Carpenter fed co-captain Dante Fabbro for a slapshot from the right point. Sophomore Gabriel Chabot also assisted. Terriers took the lead at 5:35, with junior Patrick Curry scoring on a 3-on-2 rush with sophomore David Farrance getting the primary assist and classmate Logan Cockerill getting the secondary one. Four minutes later, an MSU shot from the blueline deflected in off Gerads to knot the score at two apiece. 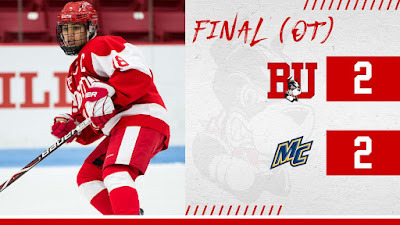 A high-sticking penalty on MSU put the Terriers on the power play, which they converted when Carpenter wristed a shot from the left circle past goal Dryden McKay after taking a cross ice pass from Fabbro. Farrance picked up his second assist. After the teams had combined for 48 shots in the first two periods, the teams clamped down with BU getting just five shots in the third period and MSU getting six, including Gerads’s game-winner. "Our (defensemen) got a little gassed," said BU Head Coach Albie O'Connell. "We had 12 minutes of (killing penalties). They had two. From an energy standpoint, we had to kill penalties. We needed to capitalize on a few of those early chances. I think we had three or four 2-on-1s and a breakaway." BU was a perfect 7-for-7 on penalty kills and scored on one of three power plays, however two of the power plays lasted a combined 45 seconds because they overlapped BU penalties. Oettinger, returning to his home state, made 31 saves including several of the highlight variety on the Mavericks’ first-period power plays and later foiling a breakaway. Freshman Joel Farabee had numerous grade A scoring chances, including a first-period breakaway that McKay turned aside. BU was without junior assistant captain Chad Krys who has a lower body injury and didn’t make the trip to Minnesota. Sophomore Ty Amonte also was out of the line-up but might return for tonight’s game, according to O’Connell. 2019 recruit Trevor Zegras scored a goal and assisted on two others as the NTDP U18s upended Michigan, 6-3. Zegras, who also scored in last week’s win against Notre Dame, has been on the score sheet in four of his five games this season. Jakob Forsacka Karlsson scored his first goal of the season in the Providence Bruins’ 4-3 overtime win against Hartford. Terriers and Merrimack played to a 2-2 overtime tie with Merrimack at Lawler Rink. BU held a 2-1 lead through two periods on goals by junior Abby Cook and senior Reagan Rust but the Warriors scored the equalizer with less than three minutes left in regulation. BU is back at Walter Brown on Saturday afternoon to take on New Hampshire with puck drop set for 3 p.m.